A macro shot of a palm and the base of several fingers; as seen here, debris can gather between the ridges. The fingerprint created by that friction ridge structure. A fingerprint is an impression of the friction ridges of all or any part of the finger. A friction ridge is a raised portion of the epidermis on the palmar (palm and fingers) or plantar (sole and toes) skin, consisting of one or more connected ridge units of friction ridge skin. These ridges are sometimes known as "dermal ridges" or "dermal papillae". 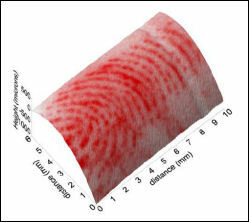 Fingerprints may be deposited in natural secretions from the eccrine glands present in friction ridge skin (secretions consisting primarily of water) or they may be made by ink or other contaminants transferred from the peaks of friction skin ridges to a relatively smooth surface such as a fingerprint card. The term fingerprint normally refers to impressions transferred from the pad on the last joint of fingers and thumbs, though fingerprint cards also typically record portions of lower joint areas of the fingers (which are also used to make identifications). On the palmar surface of the hands and feet are raised surfaces called friction ridges. The scientific basis behind friction ridge analysis is the fact that friction ridges are persistent and unique. Friction ridges are formed during fetal development where their unique characteristics emerge due to genetic and epigenetic factors (maternal diet, pH, temperature, movement of the fetus, etc.). Even identical twins do not have the same fingerprints. Uniqueness among even identical twins is due to random, or stochastic, effects during fetal development. Stochastic effects have widespread scientific acceptance as a source of uniqueness and have been observed in several animal studies which included fingerprint and other unique traits (hair patterning) between both clones and nuclear transfers. Friction ridges also persist throughout life in their permanent arrangement barring scarring or injury or until decomposition of the skin following death. Scarring occurs due to damage to the basal layer of the epidermis. Like friction ridges, scars are also persistent throughout life and are re-generated in new layers of skin. Fingerprint identification (sometimes referred to as dactyloscopy) or palmprint identification is the process of comparing questioned and known friction skin ridge impressions (see Minutiae) from fingers or palms to determine if the impressions are from the same finger or palm. The flexibility of friction ridge skin means that no two finger or palm prints are ever exactly alike (never identical in every detail), even two impressions recorded immediately after each other. Fingerprint identification (also referred to as individualization) occurs when an expert (or an expert computer system operating under threshold scoring rules) determines that two friction ridge impressions originated from the same finger or palm (or toe, sole) to the exclusion of all others. A known print is the intentional recording of the friction ridges, usually with black printer's ink rolled across a contrasting white background, typically a white card. Friction ridges can also be recorded digitally using a technique called Live-Scan. A latent print is the chance reproduction of the friction ridges deposited on the surface of an item. Latent prints are often fragmentary and may require chemical methods, powder, or alternative light sources in order to be visualized. When friction ridges come in contact with a surface that is receptive to a print, material on the ridges, such as perspiration, oil, grease, ink, etc. can be transferred to the item. The factors which affect friction ridge impressions are numerous, thereby requiring examiners to undergo extensive and objective study in order to be trained to competency. Pliability of the skin, deposition pressure, slippage, the matrix, the surface, and the development medium are just some of the various factors which can cause a latent print to appear differently from the known recording of the same friction ridges. Indeed, the conditions of friction ridge deposition are unique and never duplicated. This is another reason as to why extensive and objective study is necessary in order to train examiners to be able to reach competent conclusions. Fingerprint image acquisition is considered the most critical step of an automated fingerprint authentication system, as it determines the final fingerprint image quality, which has drastic effects on the overall system performance. There are different types of fingerprint readers on the market, but the basic idea behind each capture approach is to measure in some way the physical difference between ridges and valleys. All the proposed methods can be grouped in two major families: solid-state fingerprint readers and optical fingerprint readers. The procedure for capturing a fingerprint using a sensor consists of rolling or touching with the finger onto a sensing area, which according to the physical principle in use (capacitive, optical, thermal, etc.) captures the difference between valleys and ridges. When a finger touches or rolls onto a surface, the elastic skin deforms. The quantity and direction of the pressure applied by the user, the skin conditions and the projection of an irregular 3D object (the finger) onto a 2D flat plane introduce distortions, noise and inconsistencies in the captured fingerprint image. These problems result in inconsistent, irreproducible and non-uniform contacts and, during each acquisition, their effects on the same fingerprint results are different and uncontrollable. The representation of the same fingerprint changes every time the finger is placed on the sensor platen, increasing the complexity of the fingerprint matching, impairing the system performance, and consequently limiting the widespread use of this biometric technology. Although the word latent means hidden or invisible, in modern usage for forensic science the term latent prints means any chance or accidental impression left by friction ridge skin on a surface, regardless of whether it is visible or invisible at the time of deposition. Electronic, chemical and physical processing techniques permit visualization of invisible latent print residue whether they are from natural secretions of the eccrine glands present on friction ridge skin (which produce palmar sweat, sebum, and various kinds of lipids), or whether the impression is in a contaminant such as motor oil, blood, paint, ink, etc. These are friction ridge impressions of unknown origin which are obvious to the human eye and are caused by a transfer of foreign material on the finger, onto a surface. Because they are already visible they need no enhancement, and are generally photographed instead of being lifted in the same manner as latent prints. A plastic print is a friction ridge impression from a finger or palm (or toe/foot) deposited in a material that retains the shape of the ridge detail. Commonly encountered examples are melted candle wax, putty removed from the perimeter of window panes and thick grease deposits on car parts. Such prints are already visible and need no enhancement, but investigators must not overlook the potential that invisible latent prints deposited by accomplices may also be on such surfaces. After photographically recording such prints, attempts should be made to develop other non-plastic impressions deposited at natural finger/palm secretions (eccrine gland secretions) or contaminates. Before computerization replaced manual filing systems in large fingerprint operations, manual fingerprint classification systems were used to categorize fingerprints based on general ridge formations (such as the presence or absence of circular patterns in various fingers), thus permitting filing and retrieval of paper records in large collections based on friction ridge patterns independent of name, birth date and other biographic data that persons may misrepresent. The most popular ten-print classification systems include the Roscher system, the Vucetich system, and the Henry Classification System. Of these systems, the Roscher system was developed in Germany and implemented in both Germany and Japan, the Vucetich system was developed in Argentina and implemented throughout South America, and the Henry system was developed in India and implemented in most English-speaking countries.. In the Henry system of classification, there are three basic fingerprint patterns: Arch, Loop and Whorl. There are also more complex classification systems that further break down patterns to plain arches or tented arches. Loops may be radial or ulnar, depending on the side of the hand the tail points towards. Whorls also have sub-group classifications including plain whorls, accidental whorls, double loop whorls, and central pocket loop whorls. 1823: Jan Evangelista PurkynÄ›, a professor of anatomy at the University of Breslau, published his thesis discussing 9 fingerprint patterns, but he did not mention the use of fingerprints to identify persons. 1880: Dr Henry Faulds published his first paper on the subject in the scientific journal Nature in 1880. Returning to the UK in 1886, he offered the concept to the Metropolitan Police in London but it was dismissed. 1892: Sir Francis Galton published a detailed statistical model of fingerprint analysis and identification and encouraged its use in forensic science in his book Finger Prints. 1892: Juan Vucetich, an Argentine police officer who had been studying Galton pattern types for a year, made the first criminal fingerprint identification. He successfully proved Francisca Rojas guilty of murder after showing that the bloody fingerprint found at the crime scene was hers, and could only be hers. 1901: The first United Kingdom Fingerprint Bureau was founded in Scotland Yard. The Henry Classification System, devised by Sir Edward Richard Henry with the help of Haque and Bose was accepted in England and Wales. 1902: Dr. Henry P. DeForrest used fingerprinting in the New York Civil Service. 1906 New York City Police Department Deputy Commissioner Joseph A. Faurot introduced fingerprinting of criminals to the United States. A member of the Royal Canadian Mounted Police demonstrates the location of ridge endings, bifurcations and dots. The validity of forensic fingerprint evidence has recently been challenged by academics, judges and the media. While fingerprint identification was an improvement over earlier anthropometric systems, the subjective nature of matching, along with the relatively high error rate of matches when compared to DNA, has made this forensic practice controversial. The words "Reliability" and "Validity" have specific meanings to the scientific community. Reliability means successive tests bring the same results. Validity means that the results accurately reflect the external criteria being measured. Errors of this magnitude within a discipline singularly admired and respected for its touted absolute certainty as an identification process have produced chilling and mind- numbing realities. Thirty-four participants, an incredible 22% of those involved, substituted presumed but false certainty for truth. By any measure, this represents a profile of practice that is unacceptable and thus demands positive action by the entire community. Fingerprints collected at a crime scene, or on items of evidence from a crime, can be used in forensic science to identify suspects, victims and other persons who touched a surface. Fingerprint identification emerged as an important system within police agencies in the late 19th century, when it replaced anthropometric measurements as a more reliable method for identifying persons having a prior record, often under an alias name, in a criminal record repository. Has served all governments worldwide during the past 100 years to provide accurate identification of criminals. No two fingerprints have ever been found identical in many billions of human and automated computer comparisons. Fingerprints are the very basis for criminal history foundation at every police agency. Established the first professional certification program for forensic scientists, the IAI's Certified Latent Print Examiner program (in 1977), issuing certification to those meeting stringent criteria and revoking certification for serious errors such as erroneous identifications. Remains the most commonly used forensic evidence worldwideâ€”in most jurisdictions fingerprint examination cases match or outnumber all other forensic examination casework combined. Continues to expand as the premier method for identifying persons, with tens of thousands of persons added to fingerprint repositories daily in America aloneâ€”far outdistancing similar databases in growth. Is claimed to outperform DNA and all other human identification systems (fingerprints are said to solve ten times more unknown suspect cases than DNA in most jurisdictions). Fingerprint identification was the first forensic discipline (in 1977) to formally institute a professional certification program for individual experts, including a procedure for decertifying those making errors. Other forensic disciplines later followed suit in establishing certification programs whereby certification could be revoked for error. Fingerprint identification effects far more positive identifications of persons worldwide daily than any other human identification procedure. Some of the discontent over fingerprint evidence may be due to the desire to push the conclusiveness of fingerprint examinations to the same level of certitude as that of DNA analysis. DNA is probability-based inasmuch as an individual is genetically half from the mother's contribution and half from the father's contribution. These genetic contributions are passed down from generation to generation. While pattern type (arch, loops, and whorls) may be inherited, the details of the friction ridges are not. For example, it cannot be concluded that a person inherited a certain bifurcation from their mother and an ending ridge from their father as the development of these features are completely random. 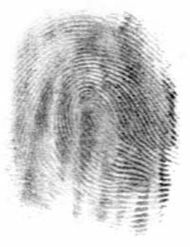 Further, fingerprints as an analogy of uniqueness has been widely scientifically accepted. For example, chemists often use the term "fingerprint region" to describe an area of a chemical that can be used to identify it. Another criticism sometimes leveled at fingerprint practice is that it is a "closed discipline". However, practitioners in the scientific community are generally specialized and may not extend to other areas of science; in this respect, fingerprint scientists are no different from the rest of the scientific community. The fingerprint community asserts that it maintains the need for objectivity and continued research in the area of friction ridge analysis. Since the late nineteenth century, fingerprint identification methods have been used by police agencies around the world to identify both suspected criminals as well as the victims of crime. The basis of the traditional fingerprinting technique is simple. The skin on the palmar surface of the hands and feet forms ridges, so-called papillary ridges, in patterns that are unique to each individual and which do not change over time. Even identical twins do not have identical fingerprints. Fingerprints on surfaces may be described as patent or latent. Patent fingerprints are left when a substance (such as paint, oil or blood) is transferred from the finger to a surface and are easily photographed without further processing. Latent fingerprints, in contrast, occur when the natural secretions of the skin are deposited on a surface through fingertip contact, and are usually not readily visible. The best way to render latent fingerprints visible, so that they can be photographed, is complex and depends, for example, on the type of surface involved. It is generally necessary to use a â€˜developerâ€™, usually a powder or chemical reagent, to produce a high degree of visual contrast between the ridge patterns and the surface on which the fingerprint was left. Developing agents depend on the presence of organic deposits for their effectiveness. However, fingerprints are typically formed by the secretions of the eccrine glands of the fingertips, which principally comprise water and inorganic salts, with only a small proportion of organic material such as urea and amino acids and detecting such fingerprints is far from easy. A further complication is the fact that the organic component of any deposited material is readily destroyed by heat, such as occurs when a gun is fired or a bomb is detonated, when the temperature may reach as high as 500Â°C. In contrast, the non-volatile, inorganic component of eccrine secretion remains intact even when exposed to temperatures as high as 600Â°C. Within the Materials Research Centre, University of Swansea, UK , University of Swansea, UK, Professor Neil McMurray and Dr Geraint Williams have developed a technique that enables fingerprints to be visualised on metallic and electrically conductive surfaces without the need to develop the prints first. The technique involves the use of an instrument called a scanning Kelvin probe (SKP), which measures the voltage, or electrical potential, at pre-set intervals over the surface of an object on which a fingerprint may have been deposited. These measurements can then be mapped to produce an image of the fingerprint. A higher resolution image can be obtained by increasing the number of points sampled, but at the expense of the time taken for the process. A sampling frequency of 20 points per mm is high enough to visualise a fingerprint in sufficient detail for identification purposes and produces a voltage map in -3 hours. So far the technique has been shown to work effectively on a wide range of forensically important metal surfaces including iron, steel and aluminium. While initial experiments were performed on planar, i.e. flat, surfaces, the technique has been further developed to cope with severely non-planar surfaces, such as the warped cylindrical surface of fired cartridge cases. The very latest research from the department has found that physically removing a fingerprint from a metal surface, e.g. by rubbing with a tissue, does not necessarily result in the loss of all fingerprint information. The reason for this is that the differences in potential that are the basis of the visualisation are caused by the interaction of inorganic salts in the fingerprint deposit and the metal surface and begin to occur as soon as the finger comes into contact with the metal, resulting in the formation of meta “ion complexes that cannot easily be removed. Scanning Kelvin Probe scan of the the same casing with the fingerprint clearly detected. The Kelvin probe can easily cope with the 3D curvature of the bullet casing increasing the versatility of the technique. Currently, in crime scene investigations, a decision has to be made at an early stage whether to attempt to retrieve fingerprints through the use of developers or whether to swab surfaces in an attempt to salvage material for DNA fingerprinting. The two processes are mutually incompatible, as fingerprint developers destroy material that could potentially be used for DNA analysis, and swabbing is likely to make fingerprint identification impossible. The application of the new SKP fingerprinting technique, which is non-contact and does not require the use of developers, has the potential to allow fingerprints to be retrieved while still leaving intact any material that could subsequently be subjected to DNA analysis. The University of Swansea group hope to have a forensically usable prototype in the near future and it is intended that eventually the instrument will be manufactured in sufficiently large numbers that it will be widely used by forensic teams on the frontline. There has recently been significant worldwide interest in the technique with articles appearing in/on BBC.co.uk, Sky News, S4C news, The Daily Mail, FHM magazine, AOL, Yahoo news, Telegraph.co.uk, The Hindu, Taipei times, Sydney Morning Herald, San Francisco Gate, The Mercury (South Africa), Brisbane Courier Mail and many others. There has also been significant interest from the Home Office and a number of different police forces across the UK. More information about the technique has been published in a number of scientific journals. Various schools have implemented fingerprint locks or registered children's fingerprints. This happened in the United Kingdom (fingerprint lock in the Holland Park School in London, databases, etc. ), in Belgium (cole Marie-JosE in LiÃ¨ge), in France, in Italy, etc. The NGO Privacy International has alerted that tens of thousands of UK school children were being fingerprinted by schools, often without the knowledge or consent of their parents. In 2002, the supplier Micro Librarian Systems, which use a technology similar to US prisons and German military, estimated that 35r0 schools through-out Britain were using such systems, to replace library cards. In 2007, it is estimated that 3 500 schools (ten times more) are using such systems. Under the Data Protection Act (DPA), schools in the UK do not have to ask parental consent for such practices. Parents opposed to such practices may only bring individual complaints against schools.. The purpose of taking children's fingerprints is to struggle against school skipping or/and to replace library cards or money for meals by fingerprint locks. In Belgium, this practice gave rise to a question in Parliament on February 6, 2007 by Michel de La Motte (Humanist Democratic Centre) to the Education Minister Marie Arena, who replied that they were legal insofar as the school did not use them for external purposes nor to survey the private life of children. Such practices have also been used in France (Angers, Carqueiranne college in the Var the latter won the Big Brother Award of 2005, etc.) although the CNIL, official organisation in charge of protection of privacy, has declared them "disproportionate." In March 2007, the British government was considering fingerprinting of children aged 11 to 15 as part of new passport and ID card (the latter having been recently implemented in the UK), also lifting opposition for privacy concerns. All fingerprints taken would be cross-checked against prints from 900,000 unsolved crimes. Shadow Home secretary David Davis called the plan "sinister." Recently, serious concerns about the security implications of using conventional biometric templates in schools have been raised by a number of leading IT security experts, including Kim Cameron, architect of identity and access in the connected systems division at Microsoft, who cites research by Cavoukian and Stoianov  to back up his assertion that "it is absolutely premature to begin using 'conventional biometrics' in schools". Biometric vendors claim benefits to schools such as improved reading skills, decreased wait times in lunch lines and increased revenues . They do not cite independent research to support this. Educationalist Dr Sandra Leaton Gray of Homerton College, Cambridge stated in early 2007 that "I have not been able to find a single piece of published research which suggests that the use of biometrics in schools promotes healthy eating or improves reading skills amongst children... There is absolutely no evidence for such claims". The Ottawa Police in Canada advised parents who fear that their children may be kidnapped to have their fingerprints taken. The FBI manages a fingerprint identification system and database called IAFIS, which currently holds the fingerprints and criminal records of over fifty-one million criminal record subjects, and over 1.5 million civil (non-criminal) fingerprint records. U.S. Visit currently holds a repository of over 50 million persons, primarily in the form of two-finger records (by 2008, U.S. Visit is transforming to a system recording FBI-standard tenprint records). In the 2000s, electronic fingerprint readers have been introduced for security applications such as identification of computer users (log-in authentication). However, early devices have been discovered to be vulnerable to quite simple methods of deception, such as fake fingerprints cast in gels. In 2006, fingerprint sensors gained popularity in the notebook PC market. Built-in sensors in ThinkPads, VAIO laptops, and others also double as motion detectors for document scrolling, like the scroll wheel. Another recent use of fingerprints in a day-to-day setting has been the increasing reliance on biometrics in schools where fingerprints and, to a lesser extent, iris scans are used to validate electronic registration, cashless catering, and library access. This practice is particularly widespread in the UK, where more than 3500 schools currently use such technology, though it is also starting to be adopted in some states in the US. Friction ridge skin present on the soles of the feet and toes (plantar surfaces) is as unique as ridge detail on the fingers and palms (palmar surfaces). When recovered at crime scenes or on items of evidence, sole and toe impressions are used in the same manner as finger and palm prints to effect identifications. Footprint (toe and sole friction ridge skin) evidence has been admitted in U.S. courts since 1934 (People v. Les, 267 Michigan 648, 255 NW 407). Footprints of infants, along with thumb or index finger prints of mothers, are still commonly recorded in hospitals to assist in verifying the identity of infants. Often, the only identifiable ridge detail in such impressions is from the large toe or adjacent to the large toe, due to the difficulty of recording such fine detail. When legible ridge detail is lacking, DNA is normally effective (except in instances of chimaerism) for indirectly identifying infants by confirming maternity and paternity of an infant's parents. It is not uncommon for military records of flight personnel to include bare foot inked impressions. Friction ridge skin protected inside flight boots tends to survive the trauma of a plane crash (and accompanying fire) better than fingers. Even though the U.S. Armed Forces DNA Identification Laboratory (AFDIL) stores refrigerated DNA samples from all current active duty and reserve personnel, almost all casualty identifications are effected using fingerprints from military ID card records (live scan fingerprints are recorded at the time such cards are issued). When friction ridge skin is not available from deceased military personnel, DNA and dental records are used to confirm identity. Henry, Edward R., Sir (1900) Classification and Uses of Finger Prints London: George Rutledge & Sons, Ltd.
Galton, Francis, MD, Sir (1892) Finger Prints London: MacMillan and Co.
Tewari RK, Ravikumar KV. History and development of forensic science in India. J. Postgrad Med 2000,46:303-308. J.S. Sodhi & Jasjeed Kaur. The forgotten Indian pioneers of finger print science, Current Science 2005, 88(1):185-191. Abel, DavidF Man wrongly convicted in Boston police shooting found dead. The Boston Globe. Henneberg, Maciej; Lambert, Kosette M., Leigh, Chris M. (1997). "Fingerprint homoplasy: koalas and humans". naturalSCIENCE.com 1.